Send 40 Multicoloured Roses to Chennai. Gifts to Chennai. Send Flowers to Chennai. Description : These 40 mixed Colour Roses with green fillers are bursting with Love, Care and best wishes for your loved one in Chennai. 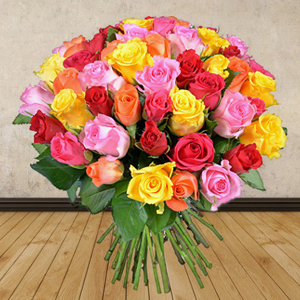 Send these Full Of Colour Roses through Gift2Chennai.com and make someone's day full of smiles. Other Gifts to Chennai can also be included to make the gift more charming.